The location is ideal for getting off the grid and enjoying private trails on the tranquil side of Continental Divide. Our private Elk Run Trail is snowmobile packed for non-motorized recreation and in the summer is a great hiking trail into Routt National Forest. Steamboat is about an hour away. The Moose Haven Cabin has beautiful views of the valley below and the Medicine Bow Mountains to the west. If you are looking for a tranquil place to un-plug this is it. 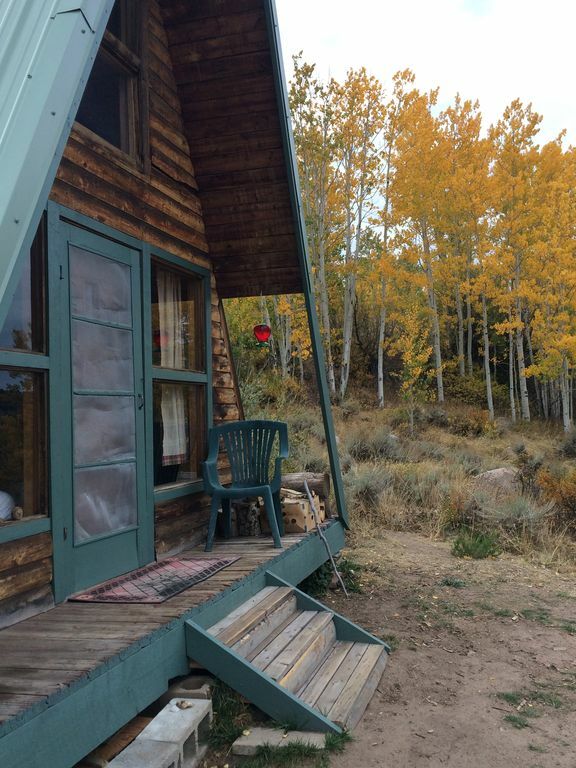 The cabin is sitting on top of a moraine in aspens and tall timothy grass. Wildlife of all species abound, moose, elk, deer, pronghorn, fox, raccoon, bear, eagle, hawks, and many species of birds. The heat is furnished by a wood stove. Lanterns provided for light. The trail is just up the road into the Routt National Forest and Mt Zirkel Wilderness offers 100's of miles of hiking. The bathroom listed is a composting bathroom 20 feet away. The remoteness, views, ability to have pets make this spot special. There is lots of Timothy Grass for horses, llamas or alpacas. Hiking or riding opportunities right from your cabin to Routt National Forest and the Mount Zirkel Wilderness makes this destination hard to beat. Downstairs is a full and twin bed and a queen fold out sofa bed upstairs. There isn't running water in the cabin however well water is provided. We supply a gas grill. Solar provides the lights and phone chargers. We can supply a cooler and ice. Lanterns and candles are supplied. A frig is available at the Shower House. We also supply the following: blankets, linens, pillows, silverware, cooking utensils, pots and pans, French Press, glasses, cups, water, firewood, matches, 3 outside chairs, picnic table and a fire-ring with grill. The shower house is within 100 feet. The Routt National Forest and Mount Zirkel Wilderness is a short hike or ride. There are over 60 trails and 70 lakes in the Zirkel Wilderness. You will be within 100 yards of the cabin from where you park. Check out our trail dubbed "Narnia" which takes you to where two waterfalls merge on the Roaring Ditch which runs about the end of May until about the first week of July. The trail is marked with Monarch Butterflies. The sink is plumbed for grey water. Lanterns and candles are supplied. Doggie bags are provided, thanks for picking up after you furry friend. There is a fire pit with a grill for cooking at the front door. The composting bathroom is 20 feet from the cabin. Our detailed directions are best to get here as other methods aren't reliable. We manage 130 acres of pristine, mountainous, property all within a short distance of many recreational opportunities. We offer remote, secluded, comfy cabins with a shower house. 20 feet from the cabin is a compost potty house. The shower house is within 50 feet of the cabin. There is a small table for two in the cabin and a picnic table outside. Routt National Forest and the Mt. Zirkel Wilderness are just up the road. We had a great time, the cabin is very cozy and was stocked with wood and water. Deb was very welcoming and accommodating. The land is incredible, many places to skii or snowshoe around. We arrived at the cabin after dark in a mid-October snowstorm, grateful for the incredible warmth emanating from the wood-burning stove Deb had gotten going for us. The crackling fire through the night kept us toasty (if a bit under-rested) and we awoke to brilliant sunshine and stunning views. The silence and beautiful, expansive surroundings were incredible and we look forward to returning for an even longer respite! The cabin was great, stocked with all the basics you need for grilling/stove cooking and easily slept 5 of us adults. You get the feel like you’re camping without having to buy all the gear and being able to sleep on a mattress which we all appreciated. We were 5 loud guys and still managed not to scare away all the wild life. The deer came out around dusk and weren’t to shy which was fun to watch. Deb the host is very responsive and welcoming. She knows the area very well so suggest using her as a resource for things to do. The Rainbow Lake hike is a must do in the Summer. The trail head is close to the property (maybe a short drive) and although it’s rated “hard” on trail maps, I found it to be more of a moderate hike. Once you get up to the lake it’s absolutely gorgeous. Suggest packing a lunch and spending a few hours up there. Great trip and would definitely book again! It was fantastic! My first time staying in a cabin. It was the best time in the mountains in a cabin the view was amazing it was great a experience and I hope to experience this again. Had a great time at the cabin amazing views and Deb was very helpful and knowledgeable on the area. I highly recommend if you're looking for place to get away from it all. Please check your weather before heading up as mountain conditions change quickly. The Jackson County Road dept. does not plow on weekends and holidays.